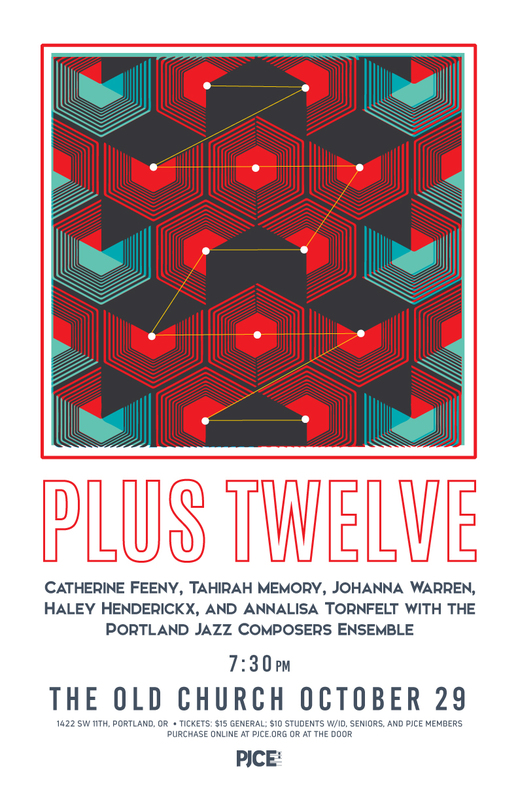 The 12-member jazz chamber orchestra, Portland Jazz Composers’ Ensemble (PJCE) presents PLUS TWELVE, a concert of original songs by five Portland-based women singer-songwriters, Catherine Feeny, Tahirah Memory, Johanna Warren, Haley Henderickx, and Annalisa Tornfelt arranged for the PJCE. This concert takes place October 29, at 7:30pm at The Old Church 1422 SW 11th in downtown Portland. Portland favorites Catherine Feeny and Chris Johnedis with PJCE Horns perform the opening set. Catherine Feeny has played internationally as a headline artist and supporting Wilco and The Indigo Girls. Her song “Afraid” from Fluff & Gravy Records’ release Catherine Feeny & Chris Johnedis has had more than 700,000 plays on Spotify. Tahirah Memory tours extensively abroad and has performed on England’s most cutting-edge radio station, BBC Radio 1. Her album, “Pride” was released to acclaim in 2015. Johanna Warren’s album ”Numun” was named among the top 10 of the year by Stereogum. Warren started independent label Spirit House in 2016 to amplify female and non-binary voices. Each song will be arranged for the ensemble by the City’s finest jazz composers including Noah Bernstein, Clay Giberson, Ryan Meagher, Kathleen Hollingsworth, Lars Campbell and others, adding an unpredictable jazz dynamism. Douglas Detrick, PJCE’s executive director says “There’s huge talent in both the jazz and singer-songwriter communities in town, but they rarely work together. We want music lovers to experience what’s possible when we have an opportunity to collaborate and make something new.” Catherine Feeny, one of Portland’s venerated songwriters, curated this group of singers, choosing artists whose memorable melodies make them a perfect fit for this unique collaboration. A sell-out crowd is expected. Get your tickets early. The Portland Jazz Composers Ensemble is a non-profit organization dedicated to commissioning, performing, and celebrating original music by Portland and Oregon-based composers.